This erudite group of "overseas buddies" who share our interest in D3s is amalgamating around a strong scientific core of investigators who participate in the worldwide symposium on enamel science (report on 2016 meeting here). You'll see the list below also includes various types of dental practitioner, families affected by D3s, and representatives from organisations and companies that support our mission. Currently 35 countries are represented by 111 friends, many of whom have become paid-up members of D3G (see map). We're keen to embrace participation from across the global community, whether you're involved in delivery of healthcare for D3s, a recipient of it, an investigator, or have a more general interest in social good. 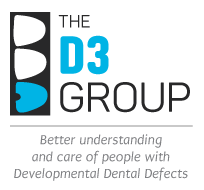 People wishing to participate in this groundbreaking group are encouraged to contact us and/or simply Join D3G. Such expansion brings with it the exciting opportunity to start thinking about what we might accomplish together as a broader collective, and also to ask what is needed to get there? Accordingly, we encourage our International Friends and Down Under members alike to share your suggestions and wishes here.